Been eating a lot of junk lately? Since my sons birthday last week, the hockey game, and no time to cook, I've been downing lots of crap meat and sugar. The body is feeling it. I need a break from it all! I'm going on a fish & veggie diet for the next week, till Thanksgiving. Not totally clean the way I do it, but it's a start! HA. Yesterday was the kick off at Lure Fishbar. A nice light lunch, that didn't make me feel guilty after. Not often I can say that! Ever been? It's located in Soho and the decor feels as if your sitting in a ship. The wood floors, porthole windows, brass fixtures and booth seating all give off that nautical vibe. I went years ago when they first opened, pre-babies, so at least a decade ago. Geez time flies! If you need reassurance for the restaurant holding it's name trust me it's just as good, if not better. 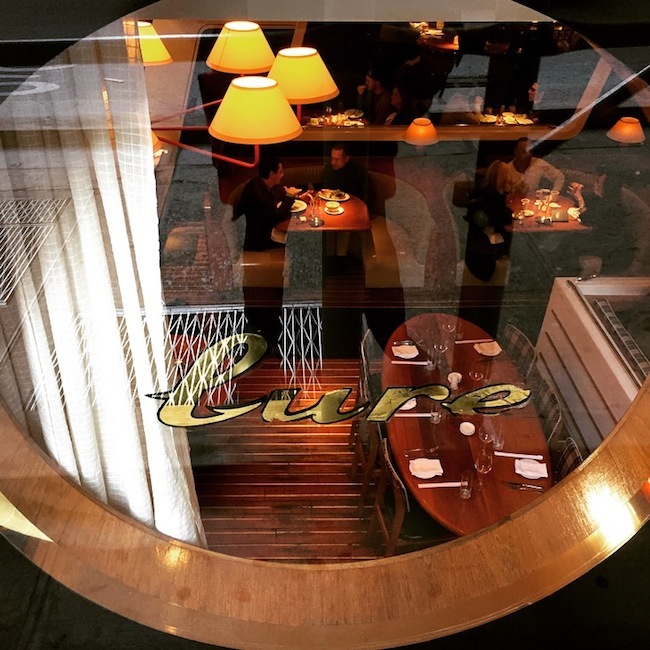 Known to be a power lunch spot, but also a good date night place. So night or day, get on deck! For starts I had the Hamachi Crudo. 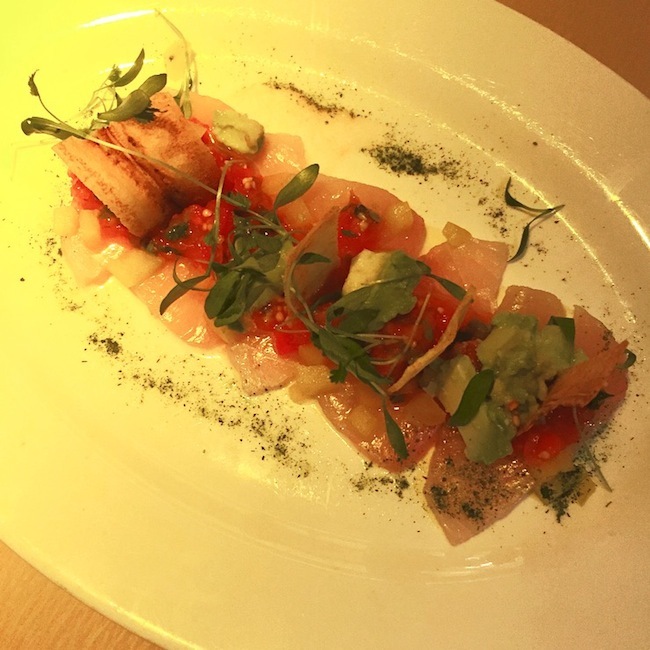 It was sashimi prepared thinly sliced Hamachi, topped with marinated tomatoes, avocado and crispy plantains, drizzled in a citrus dressing. Perfect tang, and fusion of East meets West type of dish. 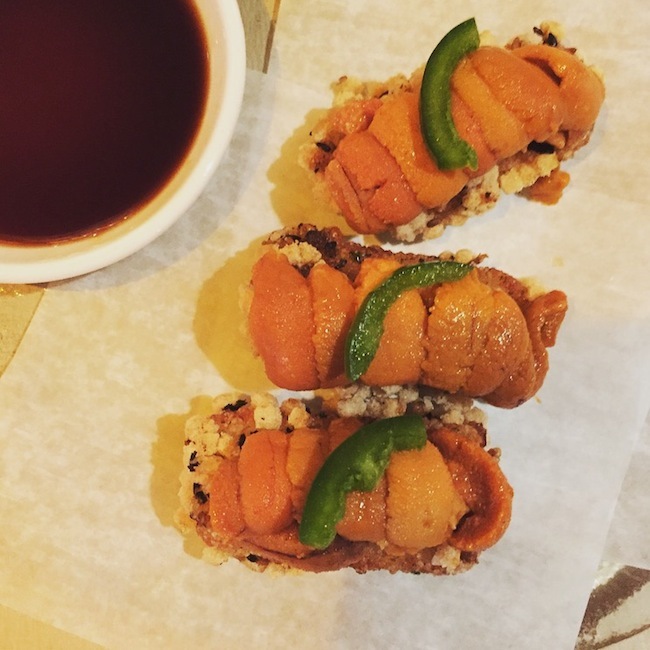 Up next the Uni Crispy Sushi Rice topped with a jalapeño slice. HEAVEN. Anything on crispy rice is yum. I had to control myself from ordering another plate! What's on my menu today? A fishy Friday at ZZ's Clam Bar. I sea - food all weekend! Just no meat, which I can easily do. The no sugar part is the real killer though. 1st world problems! HA. Have a great weekend everyone…what's on your menu?